Sixty-five years ago, Soviet soldiers liberated the Nazi's biggest concentration camp, at Auschwitz in Poland, where more than a million people, most of them Jews, were killed. Auschwitz, now a memorial and museum, was back in the headlines last month when the iconic sign hanging above its entrance saying Arbeit Macht Frei, or freedom through work, was stolen. It has since been recovered and several people have been charged over the theft. Ivan Martynushkin is a rare surviving witness to the horrors of the Holocaust, and only one of a handful still living who liberated the Nazi death camp at Auschwitz. But the 86-year-old remembers the events of January 27, 1945 with great clarity. 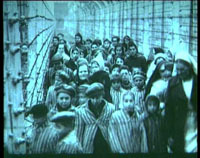 As the Soviets approached the Auschwitz concentration camp complex, in occupied Poland, in mid-January 1945, Nazi SS officers forced nearly 60,000 prisoners to march west. About 7,000 too weak or sick to move stayed behind. In total, historians say more than one million Jews, Gypsies, Soviet Prisoners of War and Poles were murdered there. Russian Federal Security Services archives place the figure even higher, saying Nazis killed more than four million at Auschwitz. Despite the hardships and horrors he experienced, Martynushkin was matter of fact as he spoke. He said he got used to it. Auschwitz was just one of many prison camps he liberated as the Soviet army marched through Ukraine and Poland, pushing back Nazi forces. BBC News co.uk. has contributed to the report.